The Guide outlines existing response structures at the local, state, and federal levels to facilitate a coordinated, well-managed, and immediate response to acute waterway debris incidents impacting coastal areas in the state of Texas. These incidents can occur during natural disasters, when large amounts of debris enter nearshore coastal waterways all at once. Disaster-related debris may include abandoned and derelict vessels, construction and demolition debris, and household hazardous waste, among other types of debris. It can be a hazard to navigation, damage habitat, and pose pollution threats. The Guide serves as a complete reference for waterway debris response in Texas. It identifies individual organizations’ roles and responsibilities and includes an overview of permitting and compliance requirements that must be met before waterway debris removal work begins. 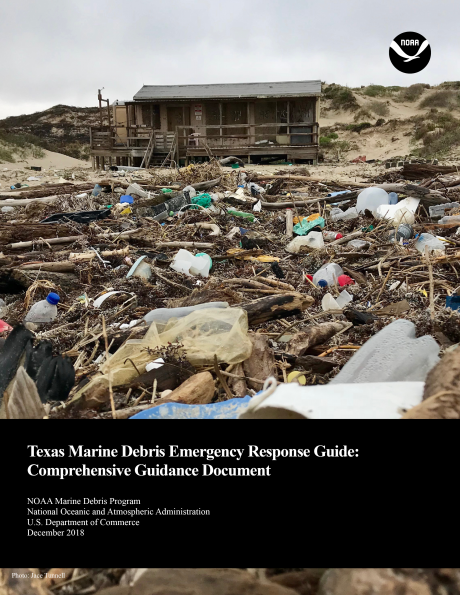 The Marine Debris Program prepared this Guide through a highly collaborative process with federal, state, and local government entities, and other Texas stakeholders. The Marine Debris Program greatly appreciates the many players that collaborated in this effort.